After yesterday's rant, I'll keep this one short. Hand destruction decks, listen to me carefully. Pack 3 of these guys. Yes, you heard me. Pack 3. If your opponent can't draw any new cards to replace their devastated hand, that just gives you 3 more turns to freely peg away at their Life Points, and even 1 of those could be the difference in the game. All other decks, use this as sideboard. Highly underrated. Time Seal gets a 3.2 in my book. It's a very solid card, and can cause real problems to your opponent if you spring it at just the right time. I like this card. It trades one of your resources for another one of your opponent's. Too bad you don't gain any card advantage... Is it deck worthy? It might be if the purpose of your deck is disruption. Basically, just play this card if it suits the kind of deck you are playing. Introduction: You don't get to draw a card! HaHaHa! draw. This could give you a little bit of time to set up some kind of move. some potential, but not just yet. In the near futhure, it might. Conclusion: Seal this card in time, then let it free when the time has come. 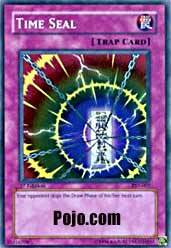 This is yet another of those trap cards that I hope are restricted to 1 per deck or discard decks will take over the current tournament environment. It's just that simple, there are way too many ways to make your opponent discard card and not enough card drawing to recover from heavy discard. Let's just hope that Upper Decks knows what they're doing and restricts all the cards that need to be restricted or they're game will be like many others out there.... Broken.